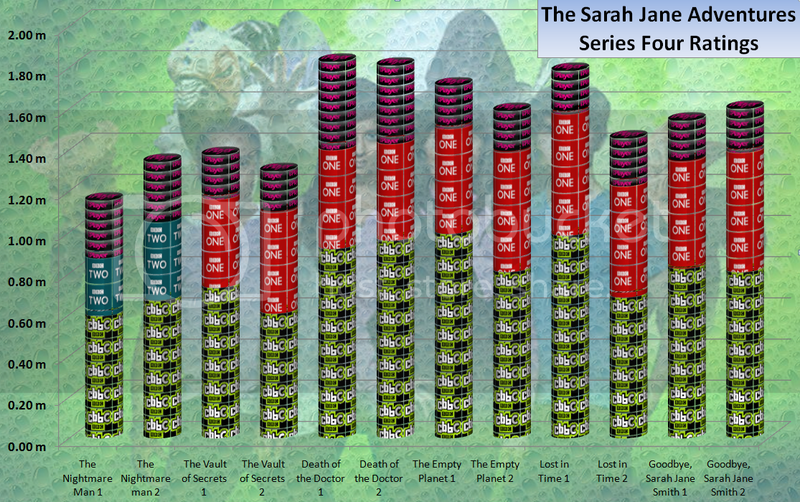 Final Ratings for Series four of The Sarah Jane Adventures are now available. This year each episode premièred on the digital Children's Channel CBBC on a Monday and Tuesday before being repeated on the mainstream BBC One later in the week. The exception to this was The Nightmare Man which was repeated on BBC Two as The Commonwealth Games were being shown on BBC One. 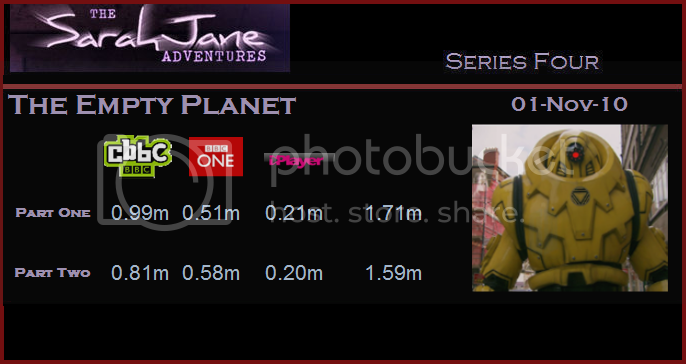 The series has done incredibly well on CBBC with Part One of The Empty Planet now holding the record for the highest rated programme on CBBC. The series was boosted with the apperance of Matt Smith and Katy Manning in Death of the Doctor half way through the series, with most of the audience staying with the show until the end. 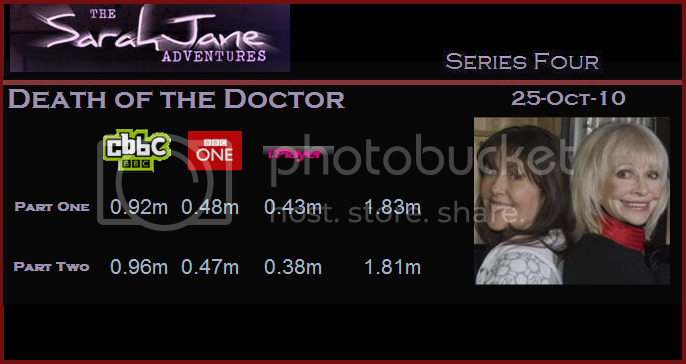 On BBC One the average rating for the series was 0.52 million or 0.49 million if the BBC Two showings are added in. 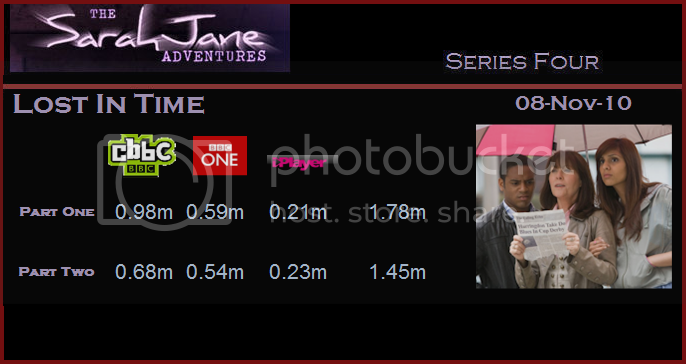 The BBC One average for this timeslot for the year so far is 0.46 million. 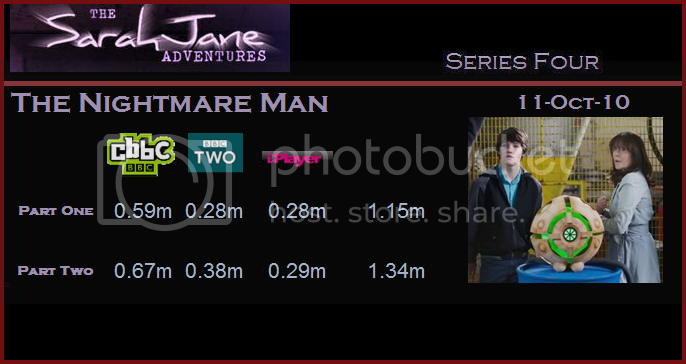 The fact that The Sarah Jane Adventures beats this, dispute this being the second showing of the week, is very impressive. By comparison the average BBC One audience for other CBBC programmes was Junior Masterchief 0.72 million; Blue Peter 0.44 million; Gastronuts 0.42 million; Relic: Guardians of the Museum 0.42 million; Amimals at Work 0.29 million; My Genius Idea 0.27 million. 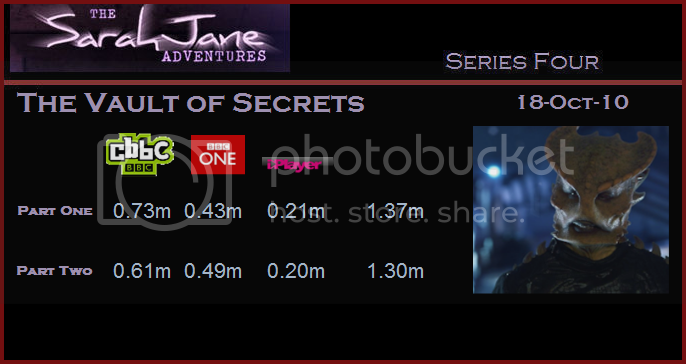 The highest combined rating was for Part One of Lost in Time which had a total of 1.57 million viewers across both channels. 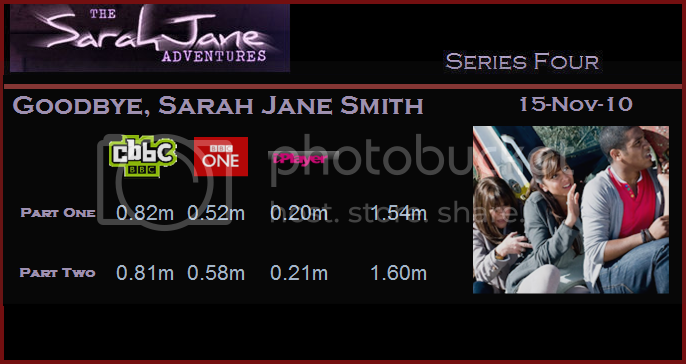 Last year the series peaked with 1.59 million watching The Wedding of Sarah Jane Smith. This year the total average for the series was 1.29 million viewers. Last year the BBC One average was 1.01 million.